The Model S P100D is the range topping Model S that provides hypercar acceleration for a fraction of the price. The Model S has features upon features upon features upon features which will be discussed below. The technology and speed of this car are truly beyond its class. The Model S P100D is powered by a 100kWh battery with power coming from an intelligent all-wheel-drive system. The rated power output tested over several dyno’s returned as much as 567kW of power (or 760HP) – we’re talking hypercar amounts of power.. In a luxury sedan! And because it’s electric, you get all 567kW of power INSTANTLY! No waiting for peak torque at 3500rpm or anything gimmicky like that, just foot down, and go, to a top speed of 250km/h. So what does all that power mean for performance? Well the P100D can do 0-100km/h in just 2.7 seconds! And this has been recorded to be as low as 2.3 seconds for some! The instant power electric feel is unlike anything ever experienced, the speed is like being on a spaceship and accelerating quickly out of the lithosphere! 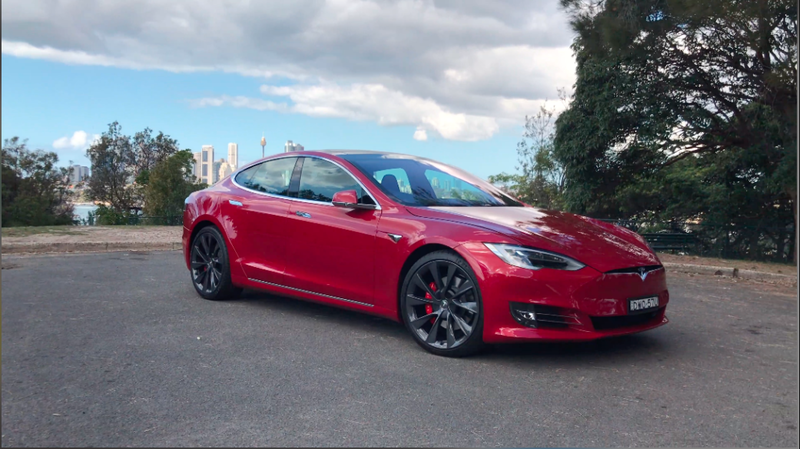 The all-wheel-drive system is necessary to keep the car planted and helps the Model S glide around corners with ease and eradicates feelings of understeer quite well. The 21” Sonic Carbon twin Turbine Wheels attached to our model have 265mm rear tyre profiles, and 245mm front tyre widths, allowing for maximum grip on windy roads. The driving modes available vary on this model – being a P100d, we’re talking LUDICROUS MODE. The acceleration can be toggled between: Chill, Sport, Ludicrous and Ludicrous plus. There is also a “Max Battery Power” option which increases power even more, but requires the batteries to be warmed up first. Ludicrous Plus can be unlocked by holding down the Ludicrous button, whereby the screen will ask if you are sure about clicking this option (if not, it says “No I want my mommy”), then it will show those star like galaxy animations and there you have it.. Max power! Don’t expect to get the 600km+ range in Ludicrous mode. Ludicrous mode is completely and utterly ridiculous, however, we found the disparity between modes to be huge! Maybe too huge? Chill mode is as slow as a Corolla, Sport mode is reasonably quick whilst Ludicrous and Ludicrous Plus are absolutely bonkers! One quick acceleration and you will be left with motion sickness, headaches and all great things that follow after feeling that much lateral G-Force.. We love it! The steering modes can also be changed to have either: comfort, standard or sport mode. Sport is much more responsive in steering and exceptionally predictable for such a large vehicle. The suspension can also be raised and lowered from the massive head unit display. It has 4 options: low, standard, high and very high. It takes about 15-30 seconds to change the height and can make a difference when deciding to either go through a windy road, or bumpy terrain. Tesla claims a 613km range for this model. We tested the Model S in a mixture of highway, city and spirited driving and managed to consume roughly 300km and used about 90% charge. Although we were primarily testing Sport/Ludicrous mode during this time. We noticed city and motorway driving didn’t make an awful lot of difference to consumption/power use – unlike petrol powered cars that use the most petrol stopping/starting. Our press car had minimal km’s on the clock, so we predict that the 600km mark for range is reasonable to assume as accurate once the batteries warm up and with less Ludicrous Mode driving. 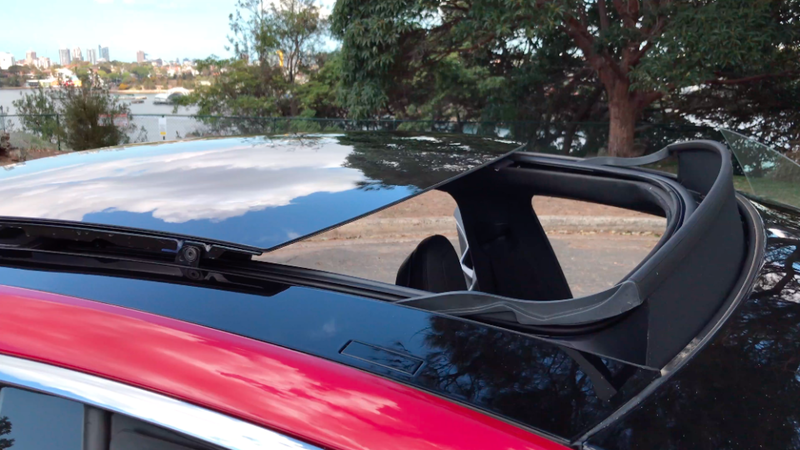 Just like the Model X, the first thing you notice when you get in the vehicle is the MASSIVE head unit – it’s essentially a huge tablet put in the middle of the car. This head unit has everything you would expect from a head unit.. And more, and even has it’s own 3G connection. This allows the car to have its own GPS system with live traffic updates (thanks to the 3G network). 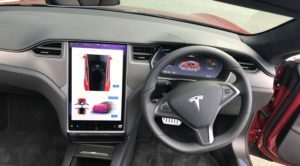 The car also comes with its own Spotify Premium subscription where music can be streamed without connecting to your mobile (again, thanks to the cars 3G network). Other features include the intelligent split screen capability – so Spotify could be opened up top, then down the bottom with the other half of the screen could be the camera, music, GPS, and even a drawing pad. The head unit allows you to have the rear camera on at all times when driving if chosen, not just when in reverse. If you click the Tesla badge up the top and wait 10 seconds, it will show you a few Easter eggs, the drawing pad being one of them. There are 5 incredibly luxurious seats that can all be heated and cooled and all can be moved around to enable more space within the cabin. Perhaps some of the comfiest seats we have been in, the front seats essentially feel like lazy boys – all they need are foot rests! The Model S has a 5-star ANCAP safety rating. Every Model S has plenty of active safety technologies including collision avoidance and automatic emergency braking. The Model S can keep itself in lanes very well, and speed up/slow down very well, but it is an aid, and cannot substitute driving. 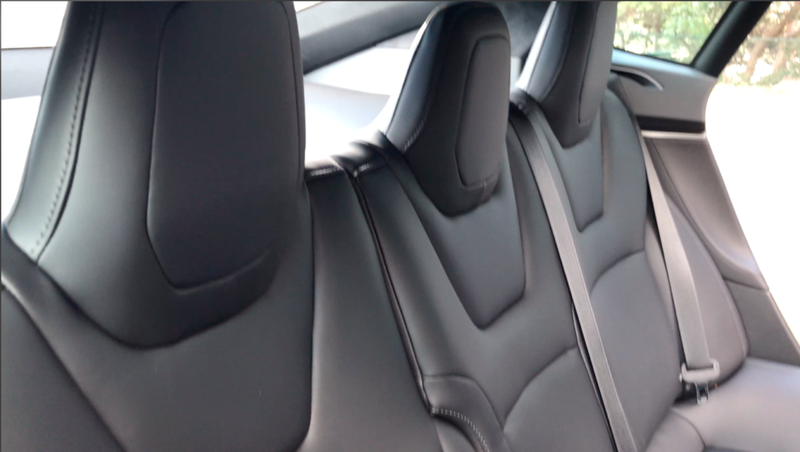 The Model S also beeps and asks you to keep your hands on the wheel every few minutes regardless. 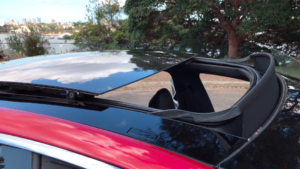 We found that whilst one of the best autonomous systems on the market, there were a few instances that the vehicle did not pickup oncoming vehicles from adjacent lanes, particularly in peak hour situations where cars are chopping in and out of lanes quite often, which can be dangerous. These features assist on long trips and on the motorway incredibly well though. As electric vehicles have no sound it is dead quiet, peaceful and incredibly comfortable. Ditches and potholes can barely be felt even despite having 21 inch mammoth rims! The only downside is you won’t realise how fast you’re going because it’s that comfortable, even though in 2 seconds you’ll be at 100km/h! The ride is incredibly predictable and can change from comfort to beast mode in Ludicrous where it wakes up and handles incredibly well. Price includes luxury car tax, stamp duty, NSW registration costs, CTP and delivery fee and is the price as of the 8th of December 2018. 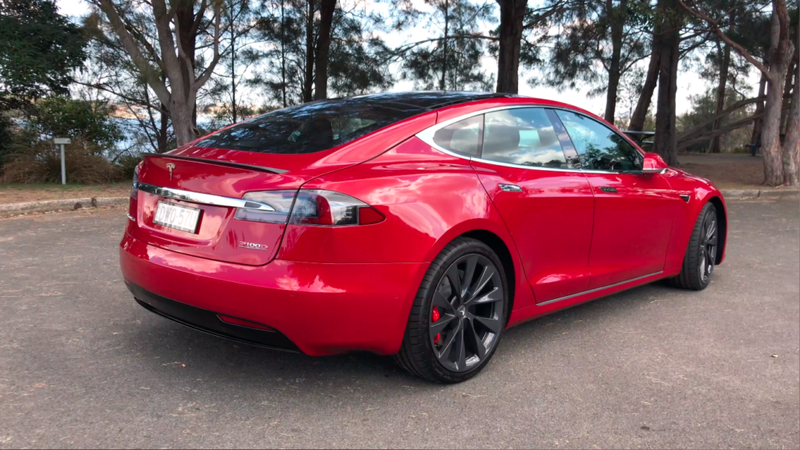 The Model S we reviewed had additional wheels (+$6300), sunroof (+$2800), red ‘multi-coat’ paint (+$3500) and enhanced autopilot (+$7000), bringing it to a total of $278,715 driveaway. It must be noted that there were price reductions after loaning this vehicle, hence the increased figure. 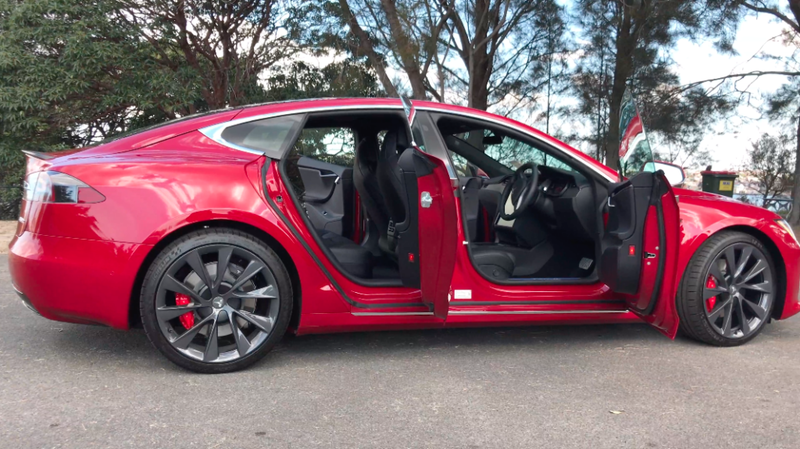 The Model S P100D is overall an exhilarating, luxurious, feature packed sedan. The insane acceleration both petrify and please any person riding in the vehicle. Despite the hefty price tag, the features list goes on and on and the ride is insanely fast, taking on supercars and hypercars.